We had a busy Saturday! We didn't make any progress on the house build, but did make a lot of progress on preparing to get up there. As our move is about 2 weeks away, we worked on packing up part of the basement. We got the toy area under the stairs cleaned out and boxed up. Only 12 more rooms to go. I also moved the motorcycle, yellow go cart, kids bikes and scooters up to Kearney. Fewer things to move later on. Reed and I were able to get the yellow one running. It had been given to us and needed some work and new parts. 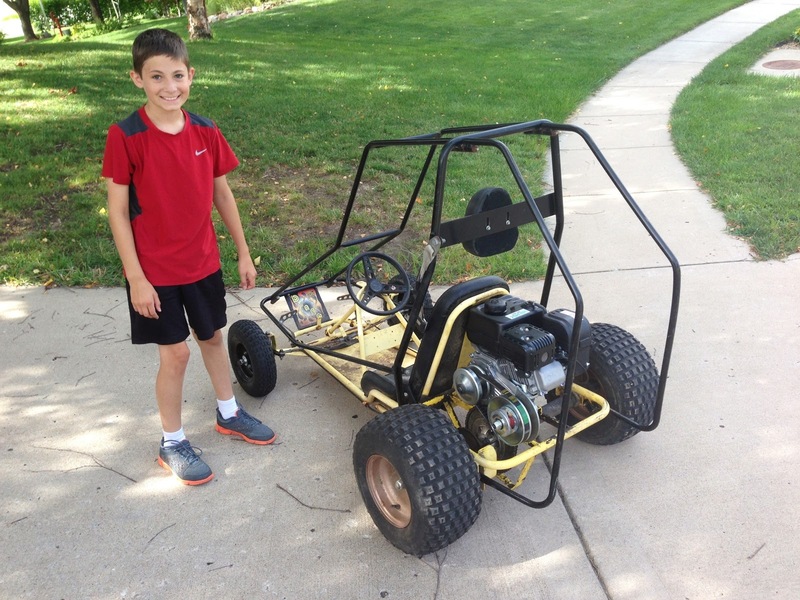 We put a new engine, torque converter, front tires, chain, and throttle cable on it. We also patched the rear tires and did a lot of other adjustments. It's now plenty fast. The first time I started it, I had the choke setting wrong and it immediately did a wheelie. I managed to grab the back frame and rotate it back until the wheels were off the ground, and then Reed got in and hit the kill switch. 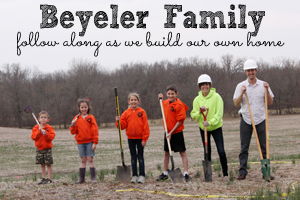 While we were up at the land, the kids modeled their new garb. When Steve and Kim bought the farm and subdivided it, they named the subdivision "Kimberly Park Farm". 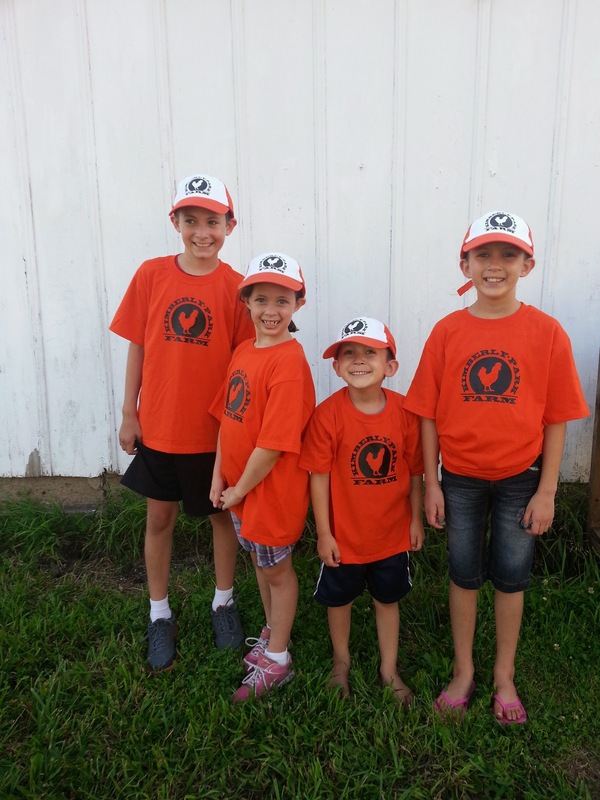 Here the kids are sporting KPF getup in prison orange, our official color. We then went and checked out the progress. With our basement floors finished, the kids were anxious to put them to use. 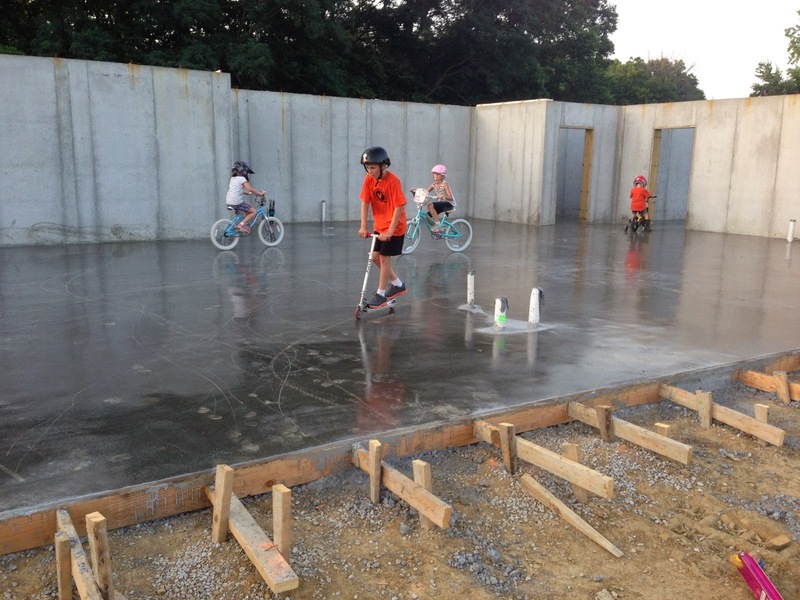 We have about 3,500 sf of concrete for them to play on. Perfect for scooters and bikes. The girls also rode their bikes along our 1/4 mile gravel drive for the first time. We figure they'll make that trek daily once we're settled in.